Although I’m originally from the UK, I’ve grown up in Eugene and went to the University of Oregon for my undergraduate degree. I received my BA in biology in 2015, with minors in chemistry and French. In my junior year, I started volunteering in the Streisfeld Lab in the Institute of Ecology and Evolution, studying adaptation and speciation in the Californian bush monkey flower. This often comes as a surprise to my friends and family, but I have a fairly poor track record of keeping plants alive. This might be why my honors project involved letting plants slowly wilt to study the genetic architecture of drought tolerance—thought to be important in local adaption. Graduation snuck up on me and I realized that although I ha been planning on taking a year off, I didn’t want to stop working in lab. I decided to stay at the UO, and I started a master’s program in the Streisfeld Lab in fall 2015. Now, I am about to start my final term. As an undergraduate, my work focused on two closely related ecotypes of Mimulus aurantiacus that grow in San Diego. Over the past couple of years, however, I have started to look at the evolutionary history of the rest of the species complex, which grows across California. I’ve been using genomic approaches to try to understand the origins of adaptive traits, such as flower color. Last spring I finally got to see the plants I study in the field when we spent a week collecting tissue in Southern California. While there I got to see between two and six of the species we study, depending on who you ask. I also spent a lot of time staring at my feet, certain I was going to step on a rattlesnake. More recently, I gave my first talk at the evolution conference in Portland, where I presented some of the most recent work from my thesis. Kimberly Jones, a Eugene native, completed an associate of arts transfer degree at Lane Community College before receiving a BS in biochemistry from the University of Oregon in 2011. She worked in the lab of Andy Berglund, focusing on the molecular mechanisms of the disease myotonic dystrophy. 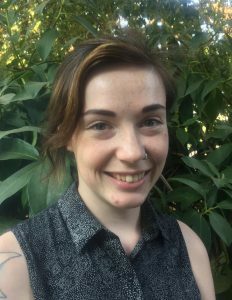 During the summer of 2010, she participated in the UO Summer Program for Undergraduate Research, which solidified her desire to continue her scientific education. Coming back to the UO for her PhD in biology, she recently finished her third year in the lab of Professor Ken Prehoda. 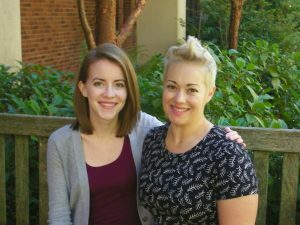 Outside of the lab, Fern and Kimberly have held leadership positions in the UO Women in Graduate Science, a student-led organization that strives for gender equality in the sciences through professional development of women at all levels. Fern Bosada is originally from Chihuahua, Mexico. She immigrated to the USA, where she completed high school and attended the University of Nevada at Reno, graduating with a BS in biochemistry. At Nevada, her research experience was made possible largely by underrepresented student-supported research programs such as McNair Scholars and the Idea Network of Biomedical Research Excellence Undergraduate Research Opportunity Program. 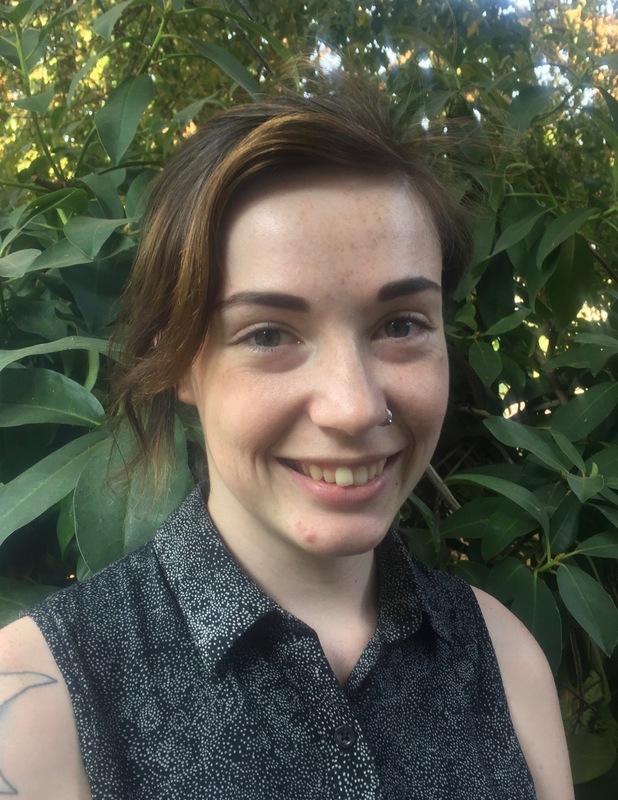 As a PhD student at Oregon in the lab of Associate Professor Kry Stankunas, she has achieved a deeper understanding of the molecular etiology of congenital heart disease by combining mouse genetics with cell, systems, and molecular biology approaches. Fern recently defended her PhD thesis and will begin a postdoctoral appointment this fall in the lab of Vincent Christoffels at the Academic Medical Center in the Netherlands. In the winter of 2014, Kimberly completed a rotation in the Stankunas lab, where she worked with Fern to better understand the roles of canonical Wnt signaling in heart valve development. She used a mouse model to assay the consequences of Wnt overactivation in valvulogenesis. This project contributed pertinent information to Fern’s thesis research and has recently been published in Development (Bosada et al., 2016). Kimberly now works in the Prehoda lab studying the establishment of Par-mediated cell polarity, a highly conserved process essential for animal tissue architecture and stem cell regulation, using a fruit fly model. In particular, she is using genetics to study how atypical protein kinase C (aPKC), the main regulator of this pathway, is controlled in terms of activity and localization. Although she does not currently work with the Wnt pathway, it is interesting to note that components of this pathway do have described roles in regulating polarity. 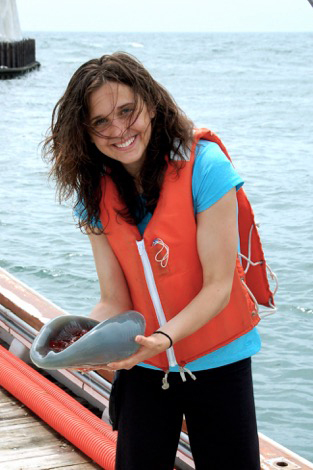 Keats in the Ariake Sea, Japan, holding Rhopilema esculentum, an edible species of jellyfish. A high school dropout from landlocked Idaho, I am perhaps one of the more improbable candidates to be working on a PhD in marine biology. Yet, here I am in an office on Onyx Bridge, in the lab with the jellyfish blazoned on the door. I grew up on the Sagebrush Ocean of southern Idaho, 500 miles from the Pacific. Despite this, or because of it, I have always had a fondness for the sea. In college, my passions were split between science and poetry, and eventually I pursued a bachelor’s degree in environmental studies, which allowed me to pursue a bit of each. Upon graduating, I was accepted into the master’s program in environmental studies at the UO. The summer before beginning the program, I read Oceana, a book by ocean activist Ted Danson, in which he writes, “Experts say we’re within a century—possibly even less—of inhabiting a world where the only viable seafood left in the oceans will be jellyfish.” This quote—hyperbole, I later learned—haunted me. Upon arriving in Eugene, I was determined to research jellyfish. (Although, at the time, I could have told you more about jellybeans than jellyfish: fruit-flavored, kidney-shaped, Ronald Reagan’s favorite). In the most fortunate coincidence of my career, just as I began graduate school, the university hired a new professor, Kelly Sutherland, who specialized in gelatinous zooplankton. Equally fortuitous, she agreed to serve as my advisor. With her guidance, I gained a deep appreciation—even admiration—for the resilience and simplicity of jellies. These organisms endlessly awe me, pulsing persistently, brainlessly, since the Precambrian. My doctoral work has shifted from “true jellyfish” (phylum Cnidaria, class Scyphozoa) to another gelatinous organism: appendicularians (phylum Chordata, class Appendicularia). Appendicularians are unique in their ability to feed on particles 10,000 times smaller than themselves— down to bacteria. This is unusual; most predator-prey ratios are around ten-to-one. As a consequence, appendicularians are an important link between bacteria and higher trophic levels. I currently research how appendicularians feed. Our research seeks to answer, essentially, whether there are mechanisms that allow these organisms to be “picky eaters,” and if so, to elucidate how this selection process occurs at the feeding-filter level. Selective feeding can have profound ecological impacts on the size and composition of the marine prey field. 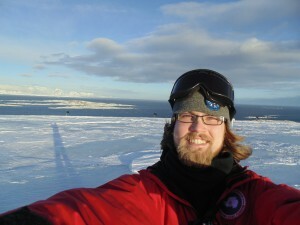 Conley is a doctoral candidate in Kelly Sutherland’s lab through the Oregon Institute of Marine Biology. Not everyone has a moment when they know what they want to pursue. I was lucky and had two. The first occurred as a senior in high school when my biology class went to a conference on the biology of aging. I listened to people talk about the questions with unknown answers, and how they were discovering solutions. Like a freshly unearthed gem or fossil, each discovery was unknown to anyone before. Suddenly, being a research scientist was not a career restricted to movies or novels. It was an actual option, and I wanted it. The second moment occurred as I took a developmental biology class at Augustana College in Sioux Falls, SD. During this course, I learned that the same core gene networks are expressed as an embryo develops, whether it is a human, a chicken, or a zebrafish. Diverse species differ less in the tools they use (i.e. genes) than they differ in what they build with those tools. For one lab project, we observed zebrafish embryos as they developed. As I followed this incredible process, I watched as the same gene networks that drove my own development were used to form something vastly different. At that point, I already knew I wanted to do research, but in that moment, I knew what I wanted to research—the evolution of gene expression. When I applied to graduate programs, one of my instructors remembered how enthralled I was with zebrafish in my developmental biology class. She suggested that I apply to Oregon, where zebrafish got its start as a model organism. A few months later, I was visiting the University of Oregon as a prospective graduate student. I loved the collaborative nature of the program and the unbridled curiosity that was evident. As I left, I knew I wanted to come back. In my first year at Oregon, I met students who became my friends and colleagues. I survived classes and quarterly exams. I did research rotations studying evolution, development and even a little neuroscience. I had rewarding experiences as a graduate teaching fellow. I even managed to have some fun through it all. At the end of my first year, I joined John Postlethwait’s lab, where I now study the evolution of gene expression in zebrafish and related species. The highlight of my time in graduate school, however, did not involve studying these small tropical species, but studying distantly related fish at Palmer Station in Antarctica. During my time in Antarctica, I sailed on a research vessel where I hauled in fish from the trawl and did in vitro fertilizations as we sailed back to the station. And I only got sick a couple times on the constantly churning seas. Back on land at the station, I set up embryo incubators with near-freezing water, helped exchange survival caches on the surrounding islands, and even got to see the first embryos of the season on the day before I headed back to Oregon. I am not what you would you would call a traditional student. Unlike most students at the University of Oregon, I enlisted in the U.S. Navy after high school. While serving as a hospital corpsman treating sick and injured Marines, I found myself increasingly interested in human physiology and psychology. I was especially interested in human cognition and a question burned in my brain: How does a three-pound fatty blob of cells in our head drive our life and experiences? Five years later I received an honorable discharge and I used my GI Bill to obtain a bachelor’s degree in psychology with a minor in biology at UC Santa Cruz. During my undergraduate studies I became hooked on the idea that all of our cognitions are based on physical neuronal systems. After graduation, I was accepted into the UO Summer Program for Undergraduate Research (SPUR). I worked in Dr. Paul Dassonville’s visual cognition lab studying human susceptibility to visual illusions. While in the program I met many students from around the world. We bonded over our strong interests in science, technology, and Oregon’s beautiful outdoor recreation. It still remains my favorite summer of all time. As a SPUR scholar, the collaborative atmosphere fostered by brilliant scientists impressed me. In particular, I was drawn to the research of Mike Wehr and his mechanistic stance that neurons drive our thoughts and behavior. 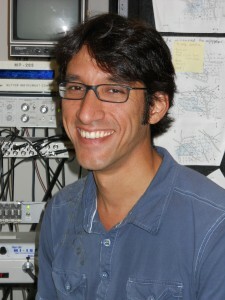 The following year, I was accepted into the biology PhD program and I soon joined Wehr’s lab. How neural circuits function in the cortex has remained an elusive problem in systems neuroscience. While the cortex is primarily comprised of excitatory neurons, approximately 20 percent are inhibitory neurons and their role is poorly understood. Scientists have long known that a sound wave originating from the right side of the body will move the right ear drum more than the left one. These eardrum movements are converted into an electrical signal and then compared in your brain. This way you can know where a sound is coming from even if you can’t see it. My work has revealed a novel role of these inhibitory cells in the processing of sound location cues in the auditory cortex. I demonstrated that in this sound localization circuit, while inhibition has little to no role in processing sounds originating from the side of the head, it plays a strong role in the processing of sounds that originate from in front of the head. I have always been fascinated with the natural world. A native Oregonian, I grew up gazing into tide pools at the coast, hunting for rough-skinned newts in the Cascades, and fishing in the countless rivers and lakes all over the state. These early interests spurred me to pursue a career as a biologist. I’m what you would consider a nontraditional student, not only because I’m older, with two teenage children, but also because I have taken a roundabout path to get to my current position. I first attended the University of Oregon in the fall of 1989, but made my way through different universities on a path that culminated in an associate of arts degree from Chemeketa Community College. I spent the next ten years running my own construction business. I returned to the UO in the fall of 2001. The research being done at the university with zebrafish and threespine stickleback piqued my interest and I found myself totally engrossed in BI 355, Vertebrate Evolution and Development, taught by Chuck Kimmel. This course introduced me to the world of “evo-devo.” To understand how an organism develops and how evolution tinkers with development to give us, as Darwin so eloquently put it, “endless forms most beautiful” is truly amazing. I immediately volunteered in Kimmel’s lab. After receiving a bachelor’s in science, I took a job as a lab technician managing stickleback aquaculture. I saw firsthand how research proceeds and was given the opportunity to contribute in many different investigations. 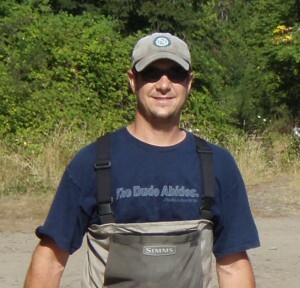 As a research technician, I took advantage of the years of accumulated zebrafish husbandry knowledge that developed at the UO and helped create resources and protocols for stickleback husbandry that are now used by researchers around the world. I also contributed to several stickleback research projects, including studies in population genomics and opercle (bone) evo-devo, some of which included collaborations with the Postlethwait and Kimmel labs. This work led to my being an author on several papers, which I found very gratifying, and it encouraged me to further my career as an independent research biologist. Today, I am a master’s student designing a project to investigate the phenotypic and genetic distribution of threespine stickleback in the Willamette Basin. Very little is known about the distribution of Oregon stickleback populations and nothing is known about the populations in the Willamette basin, which has a deep and rich geologic and anthropogenic history. To pursue my research, I am collecting stickleback from sites throughout the basin at a variety of spatial scales, and documenting specific traits important for adaptation. Taking advantage of new DNA sequencing technologies, I intend to obtain a genome-wide view of patterns of divergence across these populations, and ultimately to associate unique genomic differences with adaptations to local conditions. When my project is complete, it will be the first such detailed phenotypic and genetic study of threespine stickleback in Oregon, and one of the first such genome-scale projects of any organism.